The SC32B Optically Isolated Interface is used to connect the CS I/O port on a data logger with the RS-232 port on a PC. This interface converts the RS-232 voltage levels of the computer to the CMOS levels of the data logger. It also isolates the electrical system of the computer from the data logger, thereby protecting against ground loop, normal static discharge, and noise. 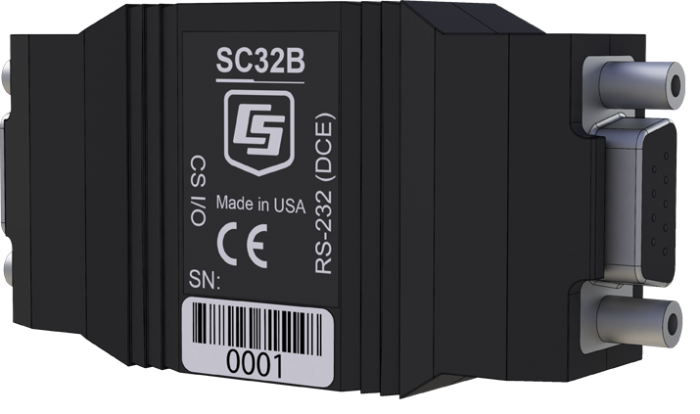 The SC32B, or another interface, is required for direct communications between a PC and a CR510, CR10X, or CR7 datalogger. For our CR800, CR850, CR1000, and CR1000X dataloggers, the SC32B is often used to provide optical isolation between the data logger and PC. Although the on-board RS-232 port of the CR3000, CR5000, or CR9000X dataloggers is isolated, the SC32B can be interfaced with their CS I/O port when a second RS-232 port is required in the application. The SC32B is shipped with an SC12 (2 ft) cable for attachment to the data logger and a 10873 (6 ft) cable for attachment to the PC. Alternatively, an SC12R-6 (6 ft) cable (purchased separately) can be used instead of the standard SC12 when a longer cable is needed. The SC32B can support RS-232 cable lengths of up to 50 feet; longer cable lengths are not recommended. The longer cable should be on the data logger side of the interface (CMOS logic levels) as opposed to the RS-232 side, which is typically more sensitive to drops in signal voltage levels. An interface such as the SC32B is required for direct communications between a PC and data loggers that only have a CS I/O port. For our CR800, CR850, and CR1000 dataloggers, the SC32B is often used to provide optical isolation between the data logger and PC. Although the on-board RS-232 port of the CR3000, CR5000, or CR9000X dataloggers is isolated, the SC32B can be interfaced with their CS I/O port when a second RS-232 port is required in the application. Why is a combination SC32B and 17934 less expensive than the SC-USB? Because the SC-USB includes a processor, it costs more to manufacture than the SC32B. Can the SC32B be used with an SDC device? No. The SC32B cannot be used at the same time as an SDC device. The SC32B is a modem-enabled device and is not capable of concurrent communication. Does the SC32B come with an RS-232 cable? Yes. It ships with both the SC12 and 10873 serial cables. Usually, the SC12 is connected to the data logger, and the 10873 is connected to the computer. Why is it important for the SC32B to be optically isolated? Non-isolated interfaces (that is, connection to the RS-232 port with a standard serial cable connection) can cause ground offset errors in analog measurements using a system connected to a PC and powered by an ac source. The SC32B provides isolation that may be important when recording low-level, single-ended voltage measurements. Did the SC32B replace the SC32A? What is the difference between the SC32A and the SC32B? The SC32A requires a 25-pin serial cable between the computer and interface. The SC32B, on the other hand, has DB9 connectors for both the data logger and computer side. The SC32B cannot be configured to pass serial printer or computer data. For comparisons, see the SC32A product page and the SC32B product page. Is a 17394 connected to an SC32B basically the same as an SC-USB? The combination of the USB to serial (17394) and the SC32B is basically the same as the SC-USB. Both options enable communication between a computer and a data logger with a CS I/O port.